There have been some big changes for white nationalist leader Richard Spencer –– a posh townhouse in Alexandria, Va., and a new website, Altright.com, staffed with a cadre of well-known leaders of the radical right. 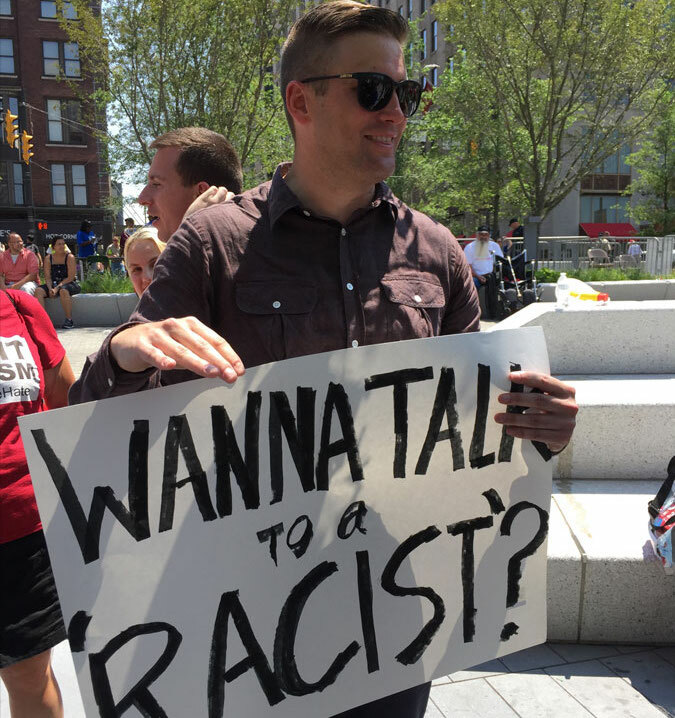 Richard Spencer at the 2016 Republican National Convention in Cleveland. Launched on Monday, Martin Luther King. Jr.’s birthday, the website promises to highlight “the best writers and analysts from Alt Right, in North America, Europe, and around the world.” But with an editorial staff handpicked from the most influential corners of the radical right, it might be worth taking that Trump-like claim of greatness with a grain of salt. Henrik Palmgren of Red Ice Radio will serve as the site’s “media director”; Brad Griffin, also known as Hunter Wallace, of Occidental Dissent will be the “news editor”; and William Regnery, who founded the National Policy Institute (NPI), a white supremacist “think tank,” will serve as the site’s publisher. Perhaps surprisingly, what connects such disparate extremists is not a unique and particular brand of white nationalism. It’s the emergence of anti-Semitism themes and messages that connects them all. A month later, Spencer participated in an interview with anti-Semite Andrew Anglin, founder of the neo-Nazi website Daily Stormer, and Michael Peinovich, who operates The Right Stuff podcast under the name Michael Enoch. During the interview, which Anglin billed as a historic meeting “to take down the Jews once and for all,” Spencer said Anglin’s preoccupation with Jews was an acceptable reaction to a “tragic, parasitic relationship." Launched, project to get control of a fracturing movement is stacked with Jewish conspiracy theorists. Regnery, the website’s publisher, also founded Occidental Quarterly, a publication edited by Kevin MacDonald, a longtime anti-Semite who has claimed that Jews, “like viruses, destabilize their host societies to their own benefit." The anti-Semitic influences apparent at Altright.com cross the Atlantic, too. Daniel Friberg, European editor for the site, is head of a Swedish mining company Wiking Mineral and co-founder of Arktos Media, a white nationalist propaganda publisher. In 2015, Friberg translated Michael O’Meara’s book New Culture, New Right: Anti-Liberalism in Postmodern Europe and Arktos reprinted O’Meara’s second edition in 2013. O’Meara, an advisory board member for Occidental Quarterly, once portrayed “cultural wars … as blood wars between competing conceptions of race and ethnicity” and has described Jews as “ideologues” attempting to “reshape the world in their own image.” Friberg also edits righton.net, a far-right online news outlet that includes misogynist Matt Forney, who claims “women are content with being… average” as one of its contributors. The anti-Semites at Altright.com keep going. Henrik Palmgren, the site’s media director, founded the ethno-centric Swedish online news source Red Ice, which regularly hosts Anglin and Holocaust-denier Matthew Heimbach. Altright.com’s cultural editor Jason Jorjani spoke at last year’s NPI conference. He also works as a lecturer in humanities at the New Jersey Institute of Technology. The creation of a centralized website for the Alt-Right also signifies Spencer’s latest attempt to unify American and European ethno-nationalists under one roof. However, those he defined as alt-right leaders last October in Washington D.C. are absent from the list. During the media-packed event, Spencer introduced Jared Taylor, founder of American Renaissance, an online magazine that regularly features proponents of eugenics and blatanat anti-black racists, and Peter Brimelow, leader of the VDARE, as leaders of the Alt-Right. But his cozy relationship with Brimelow and Taylor may have suffered after his “Heil Trump” salute, which shouldn’t come as a surprise. White nationalists have historically butted heads on Jewish conspiracy theories and Jewish participation within white nationalist circles, and the same holds true now. And Taylor’s position hasn’t changed, even if the leading figurehead of the Alt-Right has changed his views.